Walls, J.T., K.H. Wyatt, J.C. Doll, E.M. Rubenstein, and A.R. Rober. 2018. Hot and toxic: Temperature regulates microcystin release from cyanobacteria. Science of the Total Environment 610-611: 786 – 795. Few people realize just how complex water is. According to the American Museum of Natural History, a single drop of untreated water from a lake or river can contain thousands of tiny organisms, including algae and bacteria, most of which are harmless to other animals. However, some microorganisms can cause diseases, while others can stress aquatic ecosystems by growing exponentially, outcompeting native species, and depleting dissolved oxygen through decomposition. These microorganisms can be quite hazardous, and are worthy of further attention! Photo Credit: Sara Ernst, EPA’s Office of Research and Development. Cyanobacteria: Not Your Typical Microorganism. Cyanobacteria are one of those microorganisms that can endanger human health and stress an ecosystem. They are microscopic photosynthesizing organisms, meaning they use sunlight and nutrients (such as nitrogen and phosphorus) in the water column to grow. Under certain conditions, cyanobacteria populations can grow in great abundance, an event known as a bloom. As blooms die, the cyanobacteria decay and use up oxygen in the water, creating a low-oxygen environment that is stressful for fish and other aquatic life. To make matters worse, cyanobacteria can produce a toxin called microcystin. This toxin can harm animals living in the water, and can impact human health by causing liver complications and damage to the nervous system if digested. This can limit recreational use of a water body, and even impact drinking water sources if the toxin is detected in water bodies that supply local communities. This one-two punch deems cyanobacteria a dangerous adversary. How Well Do We Understand Them? Scientists are focusing their resources on discovering the conditions that cause cyanobacteria blooms to form, and what causes microcystin to be produced and released. While cyanobacteria need sunlight and nutrients to grow, water temperature is considered another important factor. This is because photosynthesis and respiration are most efficient within cells at certain temperatures. There are also some studies that suggest water temperature might be a factor in the release of microcystin, though past research has shown that more cyanobacteria growth may not mean more microcystin in the water. Unfortunately, the reasons cyanobacteria release microcystin are still not fully understood by scientists and in need of further research. Close-up view of P. agardhii at 20 micrometers. Photo Credit: Cultural Collection of Autotrophic Organisms. Past Research Yields New Ideas. A research team at Grand Lake St. Marys in western Ohio wanted to see what impact water temperature had on bloom formation and microcystin release in the water. 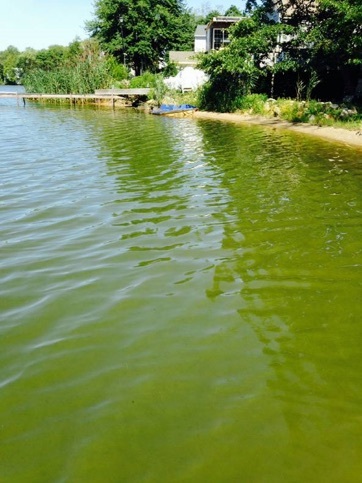 A cyanobacteria species known as P. agardhii had been blooming year-round in Grand Lake St. Marys for nearly a decade. The team studied the lake for a full year by monitoring water temperature, cyanobacteria abundance, and microcystin concentration, along with other variables. The researchers also conducted a replicate laboratory experiment, where P. agardhii were incubated in water baths with temperatures ranging from 37 to 86o F. During the experiment, cyanobacteria abundance and microcystin concentration were monitored and recorded. The lake study and laboratory experiments yielded similar results. In the lake, cyanobacteria increased as water temperatures warmed, but quickly declined after temperatures exceeded 64o F. Microcystin concentrations also increased with water temperatures, and were at their highest concentrations between 68 and 77o F. The laboratory experiment also revealed microcystin concentrations were highest between 68 and 77o F, but then quickly declined at 86o F. These results show that the P. agardhii bloom grew as water temperatures warmed, but could not tolerate temperatures above 64o F. Alternatively, microcystin concentrations were highest at these elevated temperature ranges, even as cyanobacteria abundance was decreasing. Visual diagram of study findings. When water temperatures are under 68o F (20o C), cyanobacteria abundance is high, but microcystin concentration is low. When water temperatures are equal or greater than 68o F, cyanobacteria abundance decreases, but microcystin concentrations increases. Photo Credit: Walls et al. 2018. Is Water Temperature the Key? The findings from this study are important because they suggest that water temperature may play a key role in regulating cyanobacteria abundance and the release of the microcystin toxin. More importantly, it shows that more cyanobacteria doesn’t mean more microcystin, as the concentration of toxins in the lake and laboratory experiment both increased as cyanobacteria abundance decreased. This could mean that cyanobacteria have an optimal temperature range for growth, and that microcystin may be released as a stress response when water temperatures are too high. While more research will be needed, these findings support how important water temperature is to cyanobacteria growth and microcystin concentrations. This is a critical conclusion going forward, as our planet continues to undergo rapid warming due to climate change. “159 Planktothrix Agardhii (Gomont) Anagnostidis Et Komarek.” Cultural Collection of Autotrophic Organisms. 2013. http://ccala.butbn.cas.cz/en/planktothrix-agardhii-gomont-anagnostidis-et-komarek.